Fresh off dual regular-season and tournament Big 12 championships, Kansas looks like the team to beat in March Madness. KANSAS CITY — As the games got bigger, so did the clocks. Kansas, a team whose veteran core is as stone-faced as it is talented— in order of most to least expressionless, that core is senior power forward Perry Ellis, and junior guards Frank Mason and Wayne Selden Jr.—acquired a spirit animal en route to winning the Big 12 tournament. A lot of people are excited about this Kansas team now. The Jayhawks haven’t lost since Jan. 25 at Iowa State. Fourteen straight wins since then—enough to lock up the regular-season title in the nation’s toughest league, then encore with a victorious run through the conference tournament. They’re a lock to be the No. 1 overall seed in the NCAA tournament when the field is revealed on Sunday. 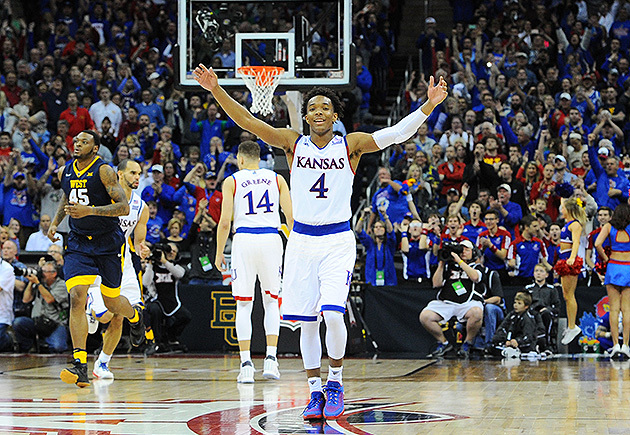 They have experience, and they have a sophomore guard, Devonte’ Graham, who scored 27 points in their Big 12 tourney final win over West Virginia and could be March’s breakout star. They look like the hottest of a field of good-but-not-historically-great teams. Pitts was feeling bullish enough on Saturday to more than triple his clock budget ($20 at a Kansas City Family Dollar, for grey plastic and chrome! ), increase its size to the extent that it covered his entire torso, and paste a newspaper-clipped photo of his nephew’s Baylor dunk over the face. ESPN cameras cut to him numerous times during the Jayhawks’ 81–71, title-game win over the Mountaineers, and afterwards, Pitts was a selfie magnet. His new Twitter feed, @TheUncleAnthony, was less than 24 hours old and had tweeted just six times, but it already had more than 1,600 followers. Kansas is riding such a wave right now that even its peripheral-viral fans can become a big deal. Uncle Anthony asked his followers late on Saturday night if he should take the rest of the month off work and keep following Kansas. The responses were an emphatic YES. 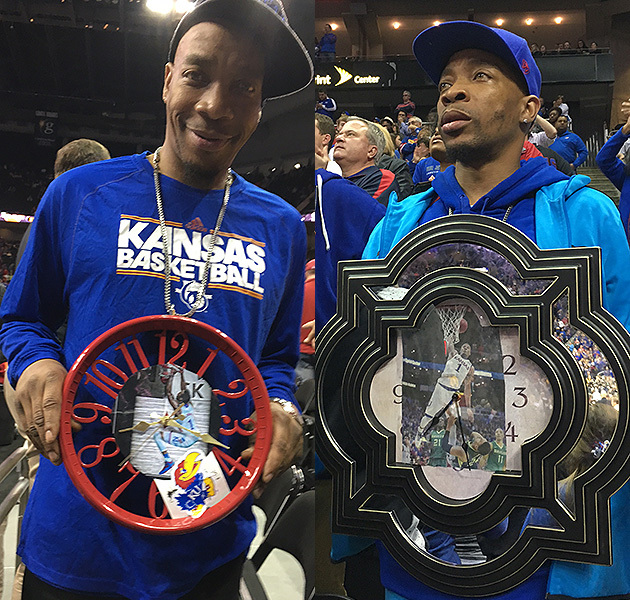 He had told a reporter, while watching KU’s Big 12 title trophy ceremony an hour earlier, that he had a feeling the Jayhawks could go on a run that would require six more clocks. "I just have faith that they can win it," Pitts said. "What better time than now?" Is this Bill Self’s time to join the club of two-time national championship coaches? He’s taken all kinds of teams into his 12 NCAA tournaments as Kansas’s head coach: a juggernaut that entered the dance No. 1 in efficiency and went on to win it all (in 2008), a juggernaut that entered No. 1 in efficiency and crashed out in the second round (the Farokhmanesh Incident, in 2010), uninspiring regular-season teams that beat the odds and made the Elite Eight (in 2004), and flawed-but-talented teams that didn’t make it out of the first weekend (2014 and ’15). That chart is a good reminder that having an efficiency monster guarantees nothing in the NCAA tournament—“We were the No. 1 overall seed in 2010,” Self said, “and we ended up screwing everything up”—but this team is clearly stronger than the non-2010 Kansas flameouts, and it has the efficiency profile of a future champion. What that data also shows, though, is that the gap between the No. 1 team and the other four prime contenders—Virginia, Michigan State, North Carolina and Villanova—is not very big at all. The Jayhawks are the analytics favorite, but they’re not the favorite by much. They’ll still need to separate themselves from the good-but-not-historically-great pack. It’s possible that Kansas won’t have to rely exclusively on Uncle Anthony as its spirit animal. The Jayhawks are in the process of grooming one from within their own roster, because they do have a guard capable of leading with boundless emotion: Graham, the guy who skipped down the court on Saturday night after hitting a big three with 15:27 to go in the second half against West Virginia, which put Kansas up nine—and the same guy who did a low-armed, airplane-style glide, 38 seconds later, after another three that put KU up 12. Graham was a game-changer. He made shots when the Jayhawks’ offense was otherwise stale in the first half; he (often singlehandedly) broke the Mountaineers’ intense press with his unflappable ballhandling; he altered the momentum in the second half. On a night where his co-point guard, Mason, was slowed by a bruised left foot and scored just four points, Graham more than delivered. Self started seeking out Graham as a potential sparkplug in January, three days after an embarrassing, 19-point loss at Oklahoma State. The coach called a meeting with his four stars—Ellis, Selden, Mason and Graham—in order to have a blunt discussion about how to fix a team that had lost three of its previous five games and was in danger of letting its 11-year streak of Big 12 regular-season championships come to an end. One of the things Self recalls saying, in so many words, was “Frank isn’t gonna be the personality of the team. Wayne’s not gonna do it, and Perry’s for sure not going to do it, so why don’t you three tell Devonte’ that he needs to do it?" Self believes that maintaining a certain degree of looseness around this team is a key to it avoiding an early-round knockout in the NCAAs, and Graham is the Jayhawk who truly exudes looseness. He bounded around the court against West Virginia with a smile on his face and a shrub of spiky braids atop his head, and in the postgame celebration, he took a bucket of confetti, pretending it was water, and dumped it out over Self’s head. Graham was also named the Big 12 tournament’s MVP, which gave him the right to make the final scissor-snip of the net at the Sprint Center, and wear it around his neck—and the credibility to make a convincing argument of why Kansas can win it all. The Jayhawks are the prime contender, Graham said, “because we’ve got good guards, we can play inside-out, [we’re] athletic, we can knock down shots. And we play pretty good defense. That’s a pretty good recipe.” Add in Graham’s timely infusion of personality, and it looks like enough to win it all.